The Providence Style Floor Lectern from Da-lite (Natural Walnut) is 25 inches wide and has a clean, modern design with quarter inch grooves to accent the simple but elegant lines of this series with a hand-rubbed natural walnut veneer for a deep, rich appearance. This lectern offers an over-size reading surface that holds a three-ring binder, and has heavy-duty industrial casters for easy mobility and a spacious storage shelf. This 25-inch lectern from a quality manufacturer - with more than 30 years of successful experience manufacturing audio-visual presentation equipment - is the answer to your presentation needs. Da-lite has over 30 years of successful experience manufacturing audio-visual presentation equipment. When investing in office furniture invest in products that has a reliable name behind it that way you can be sure to get the quality you pay for. 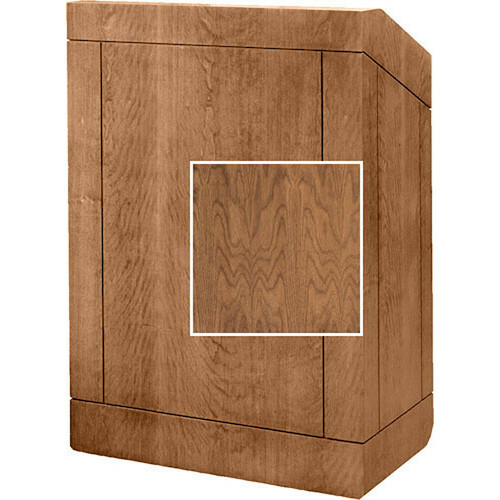 The handsome wood finish of the Providence lectern with a modern design will enhance the decor of any working space. This 25-inch floor model also includes a high-intensity reading light and LED digital clock/timer with countdown capability. Box Dimensions (LxWxH) 57.0 x 28.0 x 28.0"